Elizabeth Mitchell, a Smithsonian Folkways Recordings artist, has been recording and performing music for children and families since 1998. Elizabeth was the first new children `s music artist signed to Smithsonian Folkways in the 21st century. Elizabeth discovered her passion for making music with children in the early 1990s during her time as an assistant teacher at the Roosevelt Island Day Nursery School in New York City. There was a large international population in the school, with many different languages spoken among the children in her class and Elizabeth found that music was a common language that they could share. 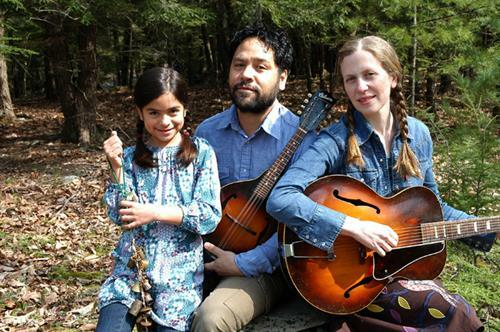 At the same time she was discovering traditional American music, immersing herself in the songs of The Carter Family and other music of the Southern Appalachian Mountains, and the recordings of Elizabeth Cotten. A trip to Stereo Jacks Record store in Cambridge MA provided a turning point for Elizabeth, when she found a vinyl ten inch copy of Woody Guthrie's "Songs to Grow on for Mother and Child." As Elizabeth states in the liner notes of her album You Are My Little Bird, "The songs that jumped off the vinyl of the Woody Guthrie record were the first songs I heard that accessed the poetry of the emerging language of children. One of my jobs as an assistant teacher was to write down the children's descriptions of their artwork. Woody's songs sounded like the stories I would hear from my students as they explained their drawings to me. I cherished these windows into their imaginations; as a songwriter it was inspiring, their minds were so free. I heard that same freedom in Woody's lyrics."